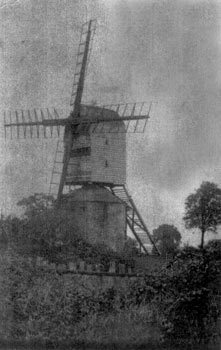 Thompson postmill stood just to the southwest of the Chequers Inn in the middle of the village.The mill buck did not have a petticoat and was set on a 2 storey roundhouse. The four double shuttered patent sails each had 8 bays of 3 shutters and rotated clockwise. A fantail was set at the bottom of the ladder and the tailpole was cut short. Towards the end of its working life the mill was being used in conjunction with a steam engine. STOLEN ar Strayed on the 17th September Inst. out of the Mill-yard of Mr. Foster of TOMPSON near Watton, Norfolk, a BLACK CART HORSE about 15 Hands high with white Spots about his Eyes and Nose and has two Spavins taken off. Whoever will bring him to Mr. Foster as above or to Robert Plummer of Diss, shall receive HALF A GUINEA for their Trouble and all reasonable Charges. A very desirable Estate at Thompson in the county of Norfolk, within four miles of Watton. A Post Windmill with an excellent Granary & Stable in the Mill yard and an inclosure of land adjoining, called the Mill Piece containing by survey 9a. 2r. 11p. in the occupation of the said Edmund Jacob. Apply to Sewell & Blake, Solrs. Norwich at whose office a Map of the Estate may be seen. Deeds of ... a post windmill sold by William Forster's executors to Wyrley Birch in 1822. Deeds of ... a windmill at Thompson passed to Walsingham Estate.. WANTED IMMEDIATELY, a middle aged Man, either married of single, who understands the MILLING & BAKING TRADE. He can have constant work. Testimonials of good character or personally to J. Lincoln, Thompson, Watton. WANTED immediately, a steady Man of middle age, who thoroughly understands the BAKING & MILLING Trade. Apply to Mr. Lincoln, Thompson near Watton. In May 1987, J. Lister of Cambridge phoned and then wrote to Harry Apling to say that William Benjamin Baker, tenant miller in 1883, was his wife's grandfather. He went on to Hildersham Mill, Cambs., in 1895. He then moved to Milton Road towermill in Cambridge and was there 1900 - 1914. George B. Baker was William's father and was the former mill at Playford, Suffolk, where William was born in 1844. On 27th April 1988, George Brown Baker wrote to Harry Apling to say that William Benjamin Baker died at Chesterton Mill, Cambridge in 1912.